The death of Mrs. N. B. Chamberlin occurred at the familv home on North Walnut, Monday evening about 6 o''clock. The funeral service will be held Fridav afternoon 4 o''clock from the Congregational church, Dr. M. M. Culpepper officiating. Burial will be made in the Olathe cemetery. Mattie Willgings Gibbons was born in Georgetown. Kv.. October 10, 1853, and was at the time of her death, 62 years, 7 months and 24 days of age. 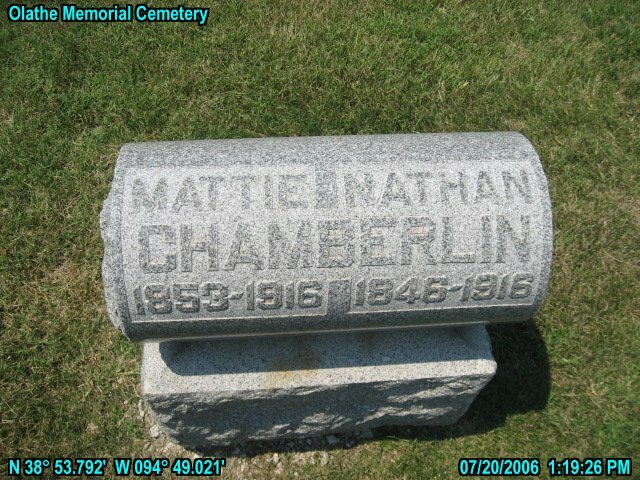 On January 1, 1873 she was united in marriage to Mr. Chamberlin, and to this union were born twelve children five of whom are now living. She came with her husband to Olathe shortly after her marriage, and this has since been her home. She united with the Episcopal church, later becoming a member of the Methodist church. which membership she has held for the past 30 years. While she had been an intense sufferer for more than two years, death came as a shock. By her death the family loses a dutiful wife and loving mother, and the town where she was highly respected, a true friend. She is survived by her husband, and three sons, Guy of Los Angeles, Claude of North Yakimo, Wash., Marvin of Olathe, and two daughters, Misses Una and Bertna. Two brothers survive. Mr. Ben Gibbons of Olathe, and Will Gibbons of Pewee Valley, Ky. Please share your memories of Mattie.